It’s back-to-school time, the best time of the year! All the fresh school supplies and newly sharpened pencils make me swoon a little, and I’m not even joking. It’s just an added bonus that my kids head out of the house to be otherwise occupied for eight hours a day by the blessed teachers of the world. 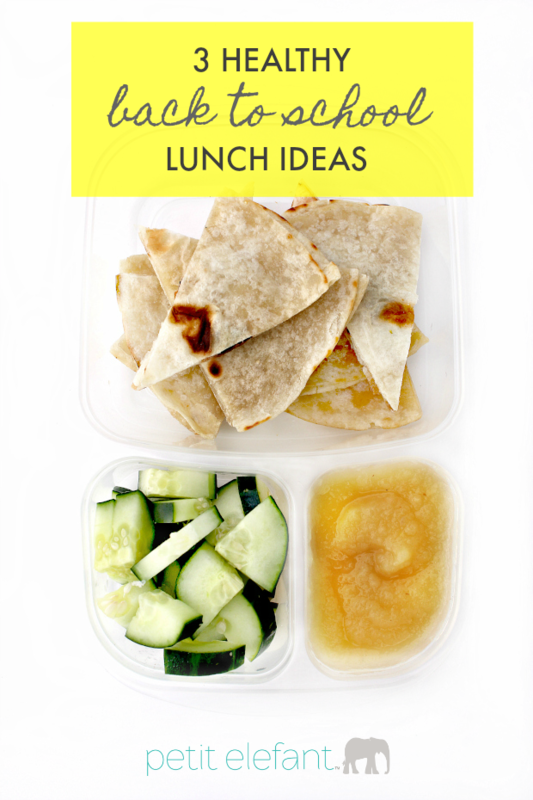 I’ve come up with three lunch ideas to get you started, but there are so many fun lunch combinations; you can come up with as many ideas as your imagination can take (and it can take plenty). I love the idea of compartmentalizing lunches, so I use plastic Tupperware to organize our lunches into categories: main dish, fruit, and veggie. Or: main dish + condiments or toppings. Mix and match one of these main entrees and a couple of sides for a well-balanced lunch for your sweet kids to eat in the cafeteria every day. Make super easy, delicious quesadillas for a busy weeknight dinner. You just need a few ingredients to whip up this simple meal! In a flat pan, cook one side of a tortilla in ½ T of butter until lightly browned. Repeat until all tortillas are browned in butter on one side. Place one tortilla in pan (use more butter if needed) with the white side face up. Sprinkle ½ cup cheese on non-browned side of tortilla. Quickly top with another browned tortilla, brown side facing up. Flatten tortillas down with a spatula and cook until cheese is melted (about a minute, maybe less). Remove from heat and use pizza cutter to slice quesadilla into wedges. Optional: serve with sour cream and your favorite salsa. Quesadillas are such a fun departure from the regular, boring peanut butter + jelly sandwich on white bread. And they’re so easy to make! In fact, I’ve included a recipe below for you to print up and have on hand the next time you need a lunch idea. Check it out. My favorite part of this tasty lunch is the cheese + meat bites cut into tiny shapes. How darling are they? (Very darling.) They’re also the perfect size to fill up on protein, all while making the entire lunch table jealous. 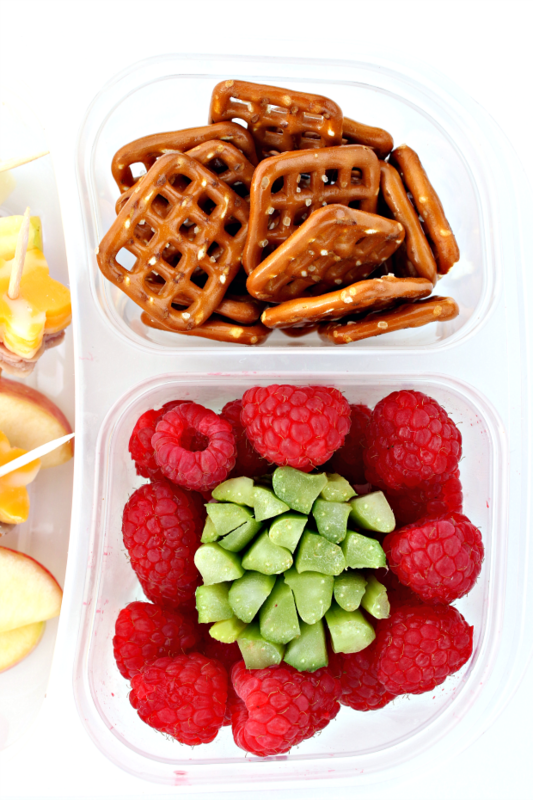 The sides of pretzels, celery, raspberries, and apple slices are great sides your kids can eat depending on how hungry they are. I happen to be the mother of two competitive swimmers, so our lunches need all the sides they can get. 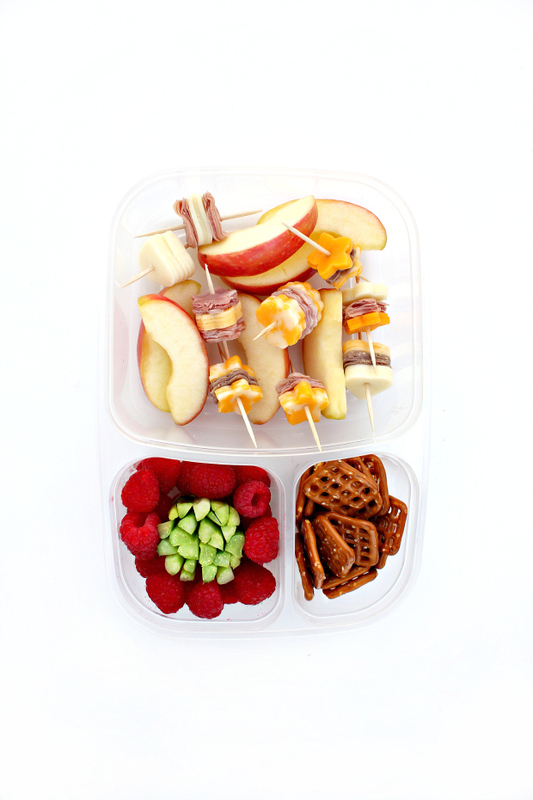 If your kids eat less just include fewer sides, or include foods like pretzels which can be eaten for an after school snack. For this lunch I made cheese + meat bites again, and added green pepper veggie bites. They’re so fun! 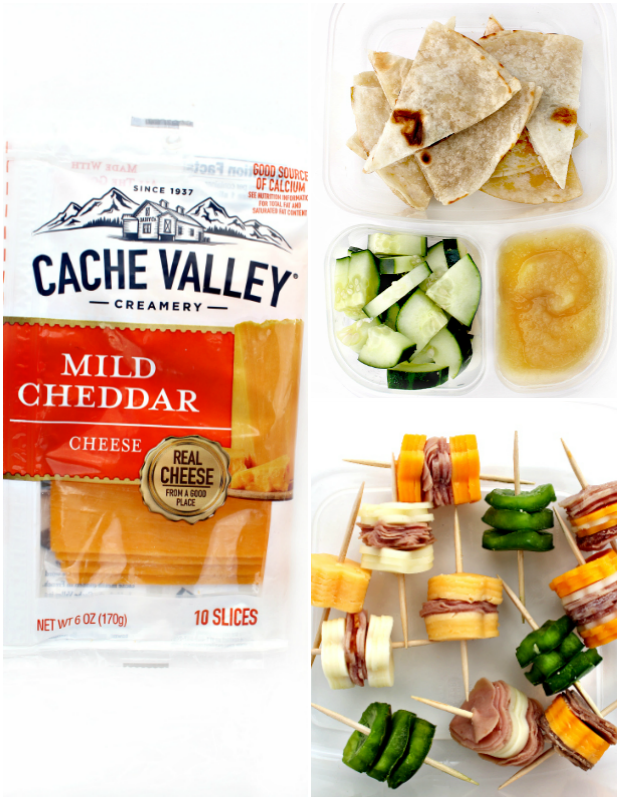 I used a variety of different CacCache Valley® Creamery cheese: Cheddar, Havarti, Colby Jack, Gouda, and Muenster. 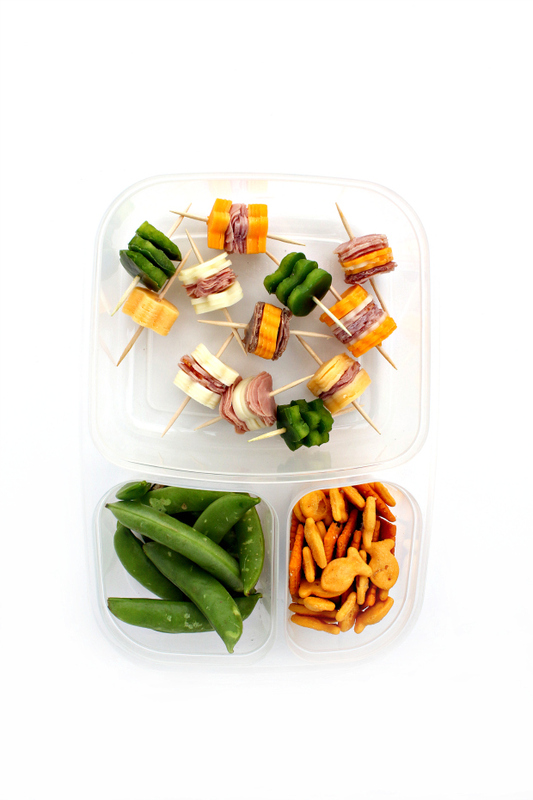 Sides of snap peas and cheese crackers round out a tasty lunch with perfect portion sizes. 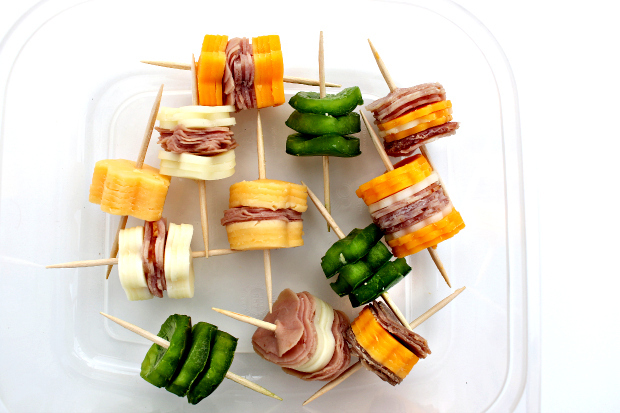 Plain slices of cheese and meat are also super easy to put into a lunch on an extra busy school morning; don’t stress about perfect presentation. 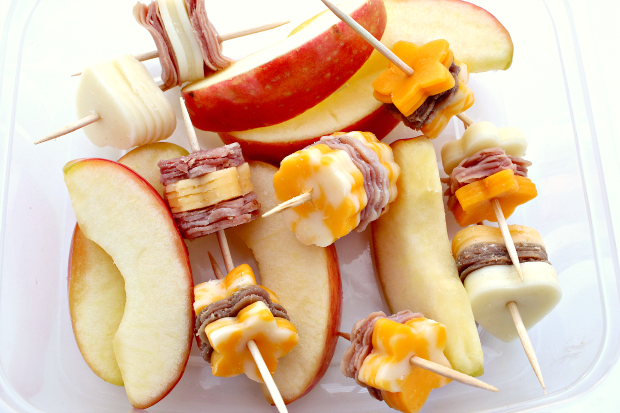 Switch it up with your kid’s favorite foods, and you’ll have a couple dozen different combinations for healthy back-to-school lunch ideas. Include your kids, and have fun making healthy back-to-school lunches all year long! Will you share all your creative lunch ideas? I’d love to add them to my own.